★ Safty,the electricity is completely separated from water,without any poisonous gas,liquid or trash letting while running. 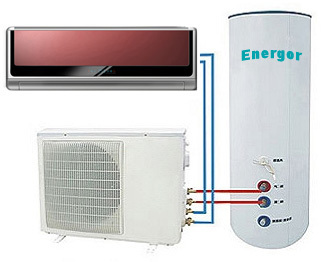 ★ Save energy and protect environment,dual-use as air conditioner and water heater,the heat efficiency can up to 800%. ★ Supply water anytime,and not be affected by geographical and weather changing. ★ Supply strong multi-point hot water,comfortable to use at anytime in need. ★ Intelligent control,the water temperature can be adjusted as needed and controlled by micro-computer automatiically. ★ Long life,the life can be 15～18 years.